Before I get into that, I wanted to share with you a few pointers for having a paradigm shift. Paradigm shifts come from a various avenues, but certainly appear more frequently when a person is seeking to change. To push this along, I tell people to create a NEW HABIT. It takes 21 Days to create a new habit…a drop in the bucket for a lifetime of residual returns! Whether its weight-loss or attaining a reading habit, you must do an activity for 21 Days straight before it becomes a part of your daily routine. Sometimes the 60-90 Day challenges can be overwhelming. So I am chopping this down by at least 3 times with a 21 Day Challenge. One day at a time…for 21 Days…to the life of your dreams! That’s it! Okay, so back to the little strategy that can help manifest your dream life. 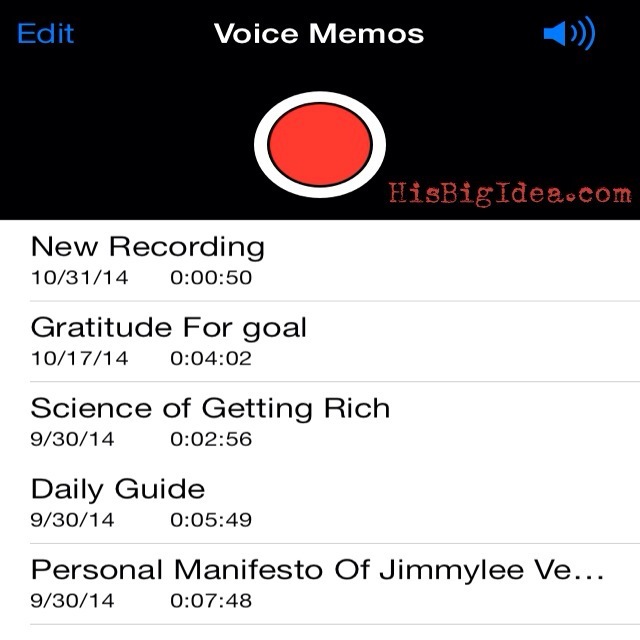 To help with this process I use this little strategy…VOICE MEMO! Yup! The little FREE add-on that comes with EVERY SINGLE cell phone. Simply record yourself stating your goals. Should only be a 2-5 minute recording. Then listen to this recording as much as possible throughout the day. I listen to my voice memo’s on my way into work (instead of the crappy talk radio shows), on my lunch break, and on my way home from work.
. It got me thinking in the right direction at all times throughout the day. Especially in the morning (when it’s rough to get up or its a rainy day). Give it a try. Don’t just take this as a “cute little tactic” and brush it off. This strategy removes the excuses…it’s FREE…it takes 2-5 minutes to record…and will have your mind shifting in NO TIME! So I challenge you to 21 days of VOICE MEMO! You can do it, just take the first step and record your goals RIGHT NOW and watch how the paradigm shift enters into your beautiful life! Let me know what you think about THIS ONE little STRATEGY in the comment section!